The fossilized remains of a fossil brooding in its nest have emerged from the red sandstones of the gobi wasteland in mongolia, providing new evidence for a far longer-lived and flexible species than previously thought. Called mpc-d 107/15, the new specimen is an oviraptor, which is the only dinosaur ever found in the act of threatening. More specifically, it belongs to the class known as nemegtomaia barsboldi, a crested ostrich-like theropod that lived in late cretaceous mongolia. A 70-million-year-old nest of the dinosaur protoceratops andrewsi has been found with proof that 15 juveniles were once indoors it, according to a paper in the latestjournal of paleontology. 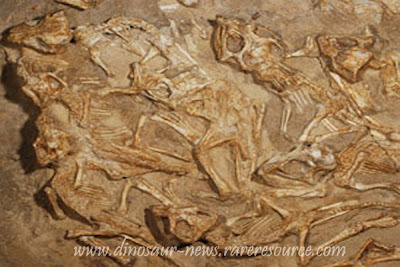 While huge numbers of eggs have been connected with other dinosaurs, such as the meat-eating oviraptor or sure duck-billed hadrosaurs, judgment multiple juveniles in the same dino nest is fairly rare.